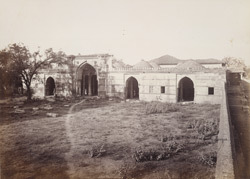 Photograph of Ahmad Shah's Mosque in the Bhadr (citadel) at Ahmadabad in Gujarat, taken by Henry Cousens in the 1880s, for the Archaeological Survey of India. The independent Sultanate dynasty of Gujarat began after the Delhi Sultanate collapsed at the end of the 14th century. Ahmad Shah (r.1411-42) founded the capital city Ahmadabad, named after himself, in 1411. His mosque in the citadel was begun soon after the foundation of the city was laid; an inscription in Arabic over the central mihrab records that the mosque was built by Ahmad Shah in 1414. The plan is based on the Jami Masjid in Cambay, built in 1325. The roof is covered with ten large domes and other smaller ones between. There were once two turrets on either side of the central archway. On either side of the central arch there are four other arched entrances and eight perforated stone windows.